Above: A Singular Vision by Steven Ketchum. So the roommate hunt is finally over. I have check and lease in hand to make sure of it. I was very lucky to find Steven Ketchum, who is a really great artist. Even though I'll miss Charles (who will only be just around the corner), I am looking forward o living with Steven. He's really cool and I very much enjoy his artwork. Today, in the post I got some limited-edition silkscreen prints to add to my collection. The very talented artist who crafted these pieces is Amy Walsh of Wondercabinet. These are the first three prints in her Specimen Series. 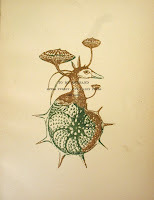 In them, she has skillfully collaged together various plants and animals to create these fantastical beings, which she then silkscreened on found vintage book pages. Aren't they great?!?! CLICK HERE to to directly to her Etsy shop. I originally saw these prints on the Design*Sponge blog and just had to have them. The original editions (of the first two) were sold out, so I had to beg her to make more, which she begrudgingly did. I cannot wait to collect the other nine that have yet to be released. My friend Karen Kraven is in from Canada! She's such an amazing and talented artist. I'm so blessed to have gotten to know her during the summer residency awhile ago. Luckily we got to hang out this trip. We got Indian food at Milon. It was good to open up to another artist and share my thoughts and insecurities about the art world. I've missed her! After Milon, we headed over to Veniero's for pastries. 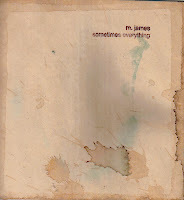 Mark (Aurea's boyfriend) gave us all a copy of his new CD, Sometimes Everything. Just finished listening to it and think it's just great. His lyrics are sheer poetry; the vibe of this album is raw. There's a physicality to it. The songs seem to bleed and ache - they are that intense! So happy he shared this with us! CLICK HERE to get your own copy. One of my closest friends from New York is leaving. Aurea and her boyfriend Mark and his daughter are moving out to L.A. 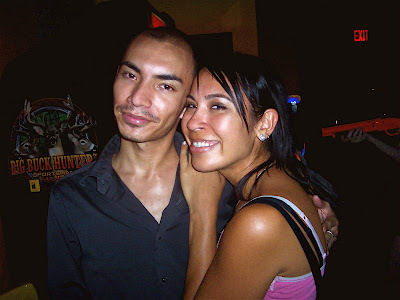 I've known Aurea for years and years now and I will miss her so much. I think we've both finally reached a place in our lives where we know what we want and can appreciate what we have. Luckily we got to hang out before she left. First we went to Moto for dinner. Can you believe that the wait was 2 hours? It is good! Then I dragged them (Aurea, Mark, Dave, Wade, and some of their friends) to Bembe (which was PACKED!) and then to East River Bar. Aurea was saying how all she wanted was a pool table and Buck Hunt. 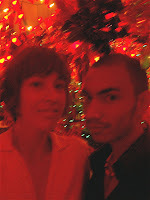 As we walked into East River Bar, we saw that the universe had conspired to help her and delivered both of her wishes. I still think she should have wished for winning the lotto or something, but hey... who can turn down a good game of Buck Hunt? 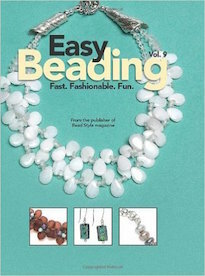 Nowadays, I don't do too many bead shows. I work maybe two a year and drop in a couple of others to catch up with my bead show buddies. When I do work the shows, I usually do the big ones like Bead & Button and the Tucson shows, but I've added to my list the Long Island Bead Festival! It's really exciting and I can't wait! I love doing the shows because you get to interact with your customers one on one. One of my favorite things to do is to see what people have been making. It is always such a creative and inspirational environment. This will be a new show for Green Girl Studios, so I'm excited to make new friends and meet new people! Earlier this evening, I stopped in the corner bodega to pick up a refreshment to go with my Chinese take-out. That's when I discovered that they carry St. Peter's English Ale! 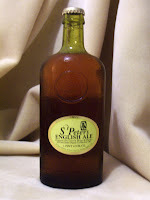 It's one of my favorite organic English Ales and it isn't that easy to find (especially not in my neighborhood). I love the green glass bottle it comes in. It's made in a castle, and gives me the feeling of drinking a potion from the sea. The other great thing is that they have wonderfully designed bottle-caps, which will later be transformed into beads. The one on the left is actually made from a St. Peter's cap. Above: My (slowly) growing Anne Choi bead collection. "Smell my owl!" 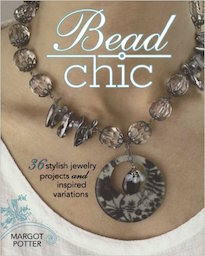 I absolutely ADORE Anne Choi beads! 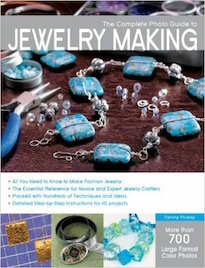 She is one of the most talented and intelligent artists in the bead world that I know. Each time I talk with her, I walk away with a nugget of inspiration. For instance, I'm still thinking about her "mermaid meat" folk-tale she related to me at Bead & Button this year. I smile every time I think of her saying, "mermaid meat." You know how they say, "You can't buy love." Well, I love my Anne Choi beads. And I probably would love anyone who bought me more. Whether I liked the person or not, I think I might be too busy polishing my dragon horde of beads. So, I guess in this case, you can buy love. *Update: I just purchased a Chicken Little bead to add to my collection! I'll take a picture and post it when it gets here. 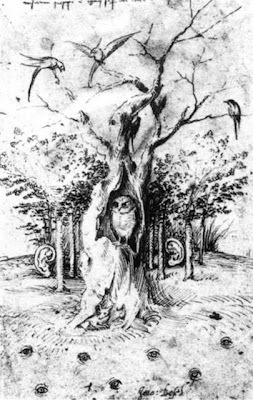 Above: The Hearing Forest and The Seeing Field by Hieronymus Bosch. Now that I'm feeling a little bit better, I've been doing some preparation work for some new paintings of mine. That means LOTS of research. I quite like it. I wonder when people see my paintings if they realize that there are hundreds of layers and that each layer has a meaning and a source of content. In any event, I came across some Hieronymus Bosch drawings. The one above is my favorite. Part of me wants to move to Berlin just so that I can go to the Staatliche Museen and examine it in person. I'm about to call it an evening, but before I do, I wanted to share what I found. I was surfing around various blogs when I came upon Ullabenulla's (a really GREAT one!) 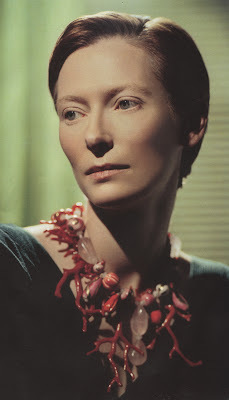 and found this picture of the ever-fashionable and stunning Tilda Swinton wearing a knock-out coral necklace. My head hurts less when I look at pictures of Tilda. Is it obvious that I have a crush on her? Yesterday was a little crazy at work. I think it was one of the busiest days we've had yet. It promises only to get worse. In any event, I had a dull headache when I left. I didn't think too much of it, but continued about my business. Or at least tried to. Eventually, when I was about to go to bed, the REAL pain begun. Normally I can avoid my migraines, but alas... this one side-swiped me. I thought if I went to bed early enough and that if I took enough medicine, I would be fine. When I woke up, my entire body was sore and in pain. I looked and felt like the Exorcist. I tried to get ready for work, but half way down the stairs, I had to run back up and puke my guts out. So today was a sick day. This is my first bracelet submission for Art Bead Scene's July challenge, The Mermaid's Grotto. I've got all sorts of goodies on this one. 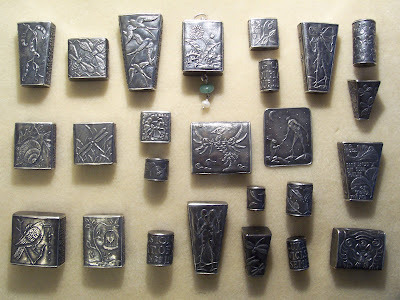 First and foremost, I have a fine pewter starfish clasp from my family at Green Girl Studios. It's really beautiful and is very reasonably priced. This is especially nice since the price of silver continues to escalate and becomes ever daunting. 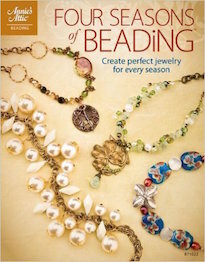 It was featured in Jamie Hogsett's new book published by Interweave Press called, Create Jewelry: Pearls. In this design, I also used wooden laser-cut beads from Lillypilly Designs, vintage Dutch trading glass from Chevron Trading Post, a lucite composite abalone shell from Pudgy Beads, stones (a snake-skin agate and kyanite) from Talisman Associates Inc., silver cornerless cubes and daisy spacers from Saki Silver, and a fine pewter swimming mermaid bead from my family at Green Girl Studios. I love pieces that are seemingly collections of treasures. I like when each component seems to have a personal history and that together with the other elements they create a richly woven story. It really elevates the piece, I think. It gives it an automatic cherished look. One of the great things about the latest book and the series in general is that it has such a following. I love the fact that everyone is reading this book now. I'm normally not so much of a trend-follower and often times "dance to the beat of my own drum," but there is truly something remarkable about the way so many people are enjoying J.K. Rowling's world at this particular time. The Monday after the book came out, everyone on the train on their commute had their book out, pouring over the pages as the trains rumbled through the tunnels. It's phenomenal how strangers will start up conversations about the books and how it really brings people together and encourages reading. For instance, the other day a woman in her late twenties or maybe early thirties was reading the book on the train. This woman was smartly dressed in business attire. Glancing over her shoulder, I saw that she had just finished a rather emotional part in the book. As she continued to read, tears slid down her face. Then all of a sudden she broke down into a heavy sob. The passengers around her comforted her and engaged in a conversation, expressing how they felt when they had read the same passage. The book has really opened up conversations between the customers at work and I. Some of them I see everyday, but keep to themselves mostly. The most in-depth our conversations get are: "Would you like room for milk in that?" But this week, we've discussed our favorite parts, what we didn't like, what we were confused about or didn't understand clearly, what we'd have liked to have seen, and all sorts of things relating to the series. It has been truly a magical week. This is another quick submission for the July Art Bead Scene challenge, The Mermaid's Grotto. This simple and elegant adjustable-length choker is FULL of movement, and I adore the way the light catches in the clear vintage Czech glass drops! They look just like drops of water. I was highly inspired by my family, Green Girl Studios' component pieces. One of my favorite ones to work with are the Mystic rings. You can use them like I have for adjustable pieces, or float stones in the middle, or use as links, or use them as the focal pendant (and those are just to name a few options)! I just love how versatile it is. The fine pewter coral brand and mystic ring are from my family at Green Girl Studios, the labordorite stones (which look almost like luminescent jelly frog eggs) are from Talisman Associate Inc., the hand-made chain is from Singaraja Imports, and the vintage Czech glass drops are from Pudgy Beads. So the latest potential roommate flaked. She said her mom was in a serious car accident and that she had to go back down to help take care of her. I hope that she is okay. It has been difficult to find the right person. I can't believe it has been this difficult. It's a great room at a great price and I think I'm a decent person to live with. So many family tragedies and so many minor issues. My fingers are crossed in my continued search. I have five days to find the perfect roommate! I just finished the latest Harry Potter book. My mind is still reeling and whirling with the bittersweet agitation. It's hard to imagine that this is the last book. All I can say is that I'm going to miss these characters. 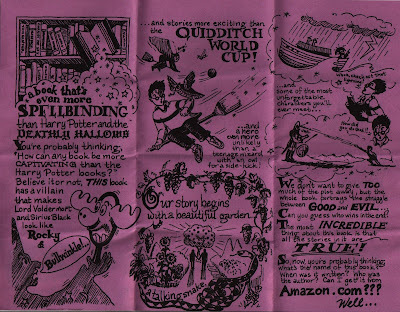 J.K. Rowling introduced a wonderful and imaginative world full of magic and adventure that will not easily be forgotten. I think she's truly accomplished something, especially when the reader internalizes the stories and really cares about the characters as if they were actually individuals in one's day-to-day life. As there is a beginning, so too is there an end to all things. 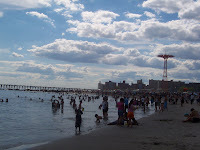 Today I joined thousands of New Yorkers on a lovely field trip out to Coney Island. The train ride there put me in an extremely good and thoughtful mood. It seemed as though many of New York's beautiful people made it out there. I love people watching and it was certainly a feast for the eyes. All different shapes and sizes, colors, moving in all sorts of manners, talking, laughing, singing. It was simply wonderful! 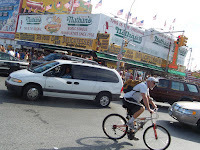 It was good to see Coney Island alive again. Though ever-present was the looming horizon. Old buildings that once stood tall, were reduced to empty lots. Boarded up windows of vacant buildings were painted and decorated to mask the reality that the end is near. I walked along the beach for some time. It was good to be by the surf. I cannot really explain the connection I feel to sea. I feel it tugging me to it. Recharging me and filling me up with a mysterious energy. Perhaps it's from my mother's blood flowing through my veins? 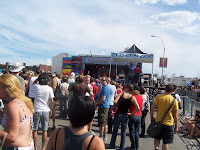 The Siren Music Festival was going on. So many people were enjoying the music. Though instead of going to a concert, I felt more drawn to sitting out in the sun and reading, enjoying the ocean rather than throngs of people. I saw my stranger there, in the crowd. We locked eyes and were moving towards one another when the current of the crowd pulled us apart. Along my walk, I found some shells. Some were from crabs and others were from mussels. As soon as I took them back to the boardwalk, they began to crumble as they dried out. I marveled out how delicate these remnants of sea-life were. Eventually, a pile of crumbs and dust was in my hand and the wind swept away the fragments. Returning them to the beach from whence they came. Against my better judgement, I braved a ridiculously long line to get a hot-dog from Nathan's. I was thinking about Jean Yates the entire time. I was inspired by her blog post about it. Though I paid the price with an upset stomach all the way home. But it was tasty and completed the trip to Coney Island. The day was hot, but a breeze wound its way around me. Even though I was miles away, I could smell a salty hint of the sea in the breeze. I was waiting on the platform for the F train. When I got on board the train, I went to the back of the train and propped myself against the locked emergency exit. It was the only free space to stand. I was engrossed in my book, but I looked up and saw someone. I couldn't take my eyes off this person. I forced myself to look back down at my book. Nothing came through. I read the same paragraph over and over, but nothing came through. All I could do was think about this nameless stranger who was only a few feet ahead of me. I shifted my weight a little bit and made so that I could see this stranger more clearly without bobbing heads and waving arms getting in the way. I felt like a rascal. Like I was doing something forbidden. All the same, I looked on. 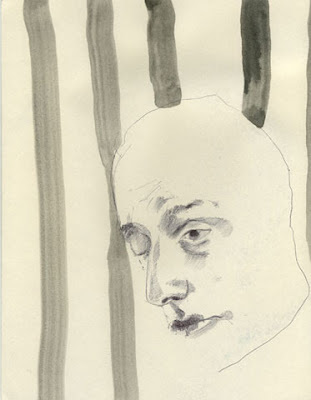 I traced their features with my eyes... that is until this unknown person looked up and looked at me. I shivered. My eyes fell straight back on the book. It felt like a clumsy movement. As though I had been caught doing something wrong. It was warm on the train, but still I felt a cold shiver run through my spine. Each time I looked up, I found those eyes looking back at me pleasantly, sometimes accompanied with a broad smile. So much so, that a secret wish formed in the pit of my stomach: Look at me. See me. Know me. Eventually my stop came and I had to leave. I exited the train, all the while feeling the stranger's gaze upon my back, shivering as though it were cold and I was in search of warmth on a hot summer day. Unfortunately, I didn't bring my camera. I would have captured some AMAZING pictures of people surrounding the entire block that the Barnes and Noble in Union Square is on. I kid you not. THOUSANDS of people were in line. Jim Dale (the voice-actor who reads the Harry Potter audio-books) was doing readings from his favorite Harry Potter books while the line swelled to enormous proportions. It was funny to be at the back of the store, because you could see the Barnes and Noble employees in their Harry Potter regalia chain-smoking and running over to the Old Town Bar for quick shots. HA! The great thing about these lines is that everyone is SUPER nice and very in the spirit of the books. I chatted with several different people in line about the books and the line and what their weekend plans were. Eventually though, I decided that waiting in line with wristbands that was thousands of people long was ridiculous. So, I got out of line and went to the other Barnes and Noble on 18th Street. They had just locked the doors as the store was filled to capacity. This did not stop my quest though. I walked down the block to my favorite children's book store, Books of Wonder. Even though the book wasn't as cheap as say from Amazon.com or from Barnes and Noble with my Member's Discount, I did get a load of free stuff and I didn't have to wait in line for three hours. I got a free cupcake, exclusive Harry Potter bookmarks, a Half-Blood Prince tote bag, and a poster and an assortment of Harry Potter knick-knacks. Books of Wonder also had the bird santcuary come in and had a presentation on owls! I love owls. And it was nice to be up close and personal with a few. I really wish that I had gotten a picture of them. I also saw some of my regulars, many of them all dressed up in their wizarding finest. I will have to let them know that I saw them when they stop in for their coffee. Mary Grandpre, the artist who illustrates the books will be at Books of Wonder today from 1PM to 3PM. Oh, and on my way home, I passed the Barnes and Noble in Union Square... line still thousands of people long, after I had got my copy AND had a cupcake. You know where I'll be and what I'll be getting. Out of intuition, I went to Paula Cole's website. In previous years it was left dormant, a time-capsule of a once glimmering career. It has since been revived with her latest album, Courage. These deeply emotional melodies have become all the richer from her time off to raise a fragile child, pursue academia, and refocus on what is important to her. I feel as though I've grown along with her on her voyage and can relate to the disillusionment that can be found in the grind-shop that is careerism, and the personal joy and satisfaction in making art. I praise Paula Cole's courage and her long-awaited return. Almost finished re-reading The Dark Is Rising by Susan Cooper. I forgot just how much I enjoyed these books. It's been busy around here. Working hard on all my various projects. 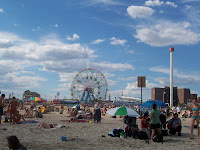 I'm making plans to go to the Siren Music Festival this weekend at Coney Island before it is no more and enjoy some beach time while it lasts. My prospective roommate flaked out, so it's back to trying to find a new one. The new potential roommates are promising. This is another quick one for this month's Art Bead Scene challenge, The Mermaid's Grotto. It's a reprise of an earlier design that I did while in Tuscon, but updated and with more of the logistical kinks worked out. 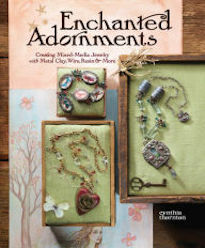 Originally there was a streamer of Swarovski crystals and a mermaid dangle that went through the mermaid coin. Unfortunately, movement and various size issues chipped the crystal and deemed it less successful. However, the new design allows for various length changes with the handy-dandy brass hook from Vintaj. Adjustable and versatile pieces are my FAVORITE! I wanted to accentuate some of the rusty browns that naturally occur in kyanite. I love blue and brown combinations. The fine pewter mermaid ring and the "hugging" mermaid bead are from my family at Green Girl Studios. All of the stones are from Talisman Associates Inc., seedbeads from Jane's Fibers and Beads, Swarovski crystals from Fusion Beads, heavy silver chain from Jess Imports, finer silver chain from Saki Silver, and brass hook from Vintaj. Oh, and the pressed Czech glass bead is from Raven's Journey. One of my favorite regulars, Edna, brought me a pile of CDs today! What a wonderful surprise and lovely gift! I love music and she was so generous. I really appreciate it. She got me new music by Corinne Bailey Rae, Lily Allen, Interpol, Suzanne Vega, The Magic Numbers, A Fine Frenzy, Air, and KT Tunstall. Some of them are long-time favorites and others will be new discoveries. I cannot wait to listen to them all! I will have to do something especially nice to show my gratitude for such a delightful surprise! Thank you, Edna! I awoke to the sound of thunder. Early this morning, sheets of rain fell heavily from the sky. It was pitch-black outside, except for the periodic flashes of lightning. Water gushed forcefully from the gutter-pipes and washed down the streets in small rivers. Strong winds whipped around, making signs and trees sway. I futilely rolled my pant-legs up, put on my sandals and got my umbrella (putting my socks and work shoes in my bag) and proceeded to make my way to open the store. I ran, splashing as I went with each foot-fall, to the subway station. The umbrella did little to prevent the rain from drenching me completely. During my rush to the station, I slipped several times, only just catching my precarious balance each time. At one point as I was crossing one of the streets, one of my sandals washed off my foot and was part way down the street with the quick current of the new street-river. I dashed after it on one foot, fearful of stepping on a used hypodermic needle in the gutter. When I finally got on the train, I was dripping wet. The quick run through the rain made my chest heave up and down. My underwear was completely (and uncomfortably) soaked through. I had to fish out my cell phone from my pant pocket to make sure that it wouldn't get wet and water-damaged. The cold air of the train made me shiver. One would think that the day would be miserable, but it was actually quite fun. And after a quick squeezing of my under-garments and drying off with the paper towels in the bathroom at work, the day went by quickly and on a very humorous note. When asked how I was doing, I would solemnly say with an awkward twist of my mouth, "My underwear's still wet." Which always seemed to provoke a riot of thunderous laughter. As I walked home from the train today, I saw the most beautiful formation of birds. Normally they spiral about and seemingly swim upon the wind. Which is beautiful to see as well. But, today, it was the way that they all flew in a straight line that struck me. It seemed to be a direct message: Keep doing what you're doing. Go forward. I felt all filled up. I have a wonderful family who is constantly inspiring me and challenging me creatively. Our connection runs deep. We are bound with more than just blood, but a sense of communal memory. That alone would be enough, but still yet I am even more lucky. I have friends whom I deeply cherish. Some that I have known for years, others who are still new to my heart. Some of them are close and others are far flung, but regardless... our times together glow fondly in my mind. This too is would be reason enough to feel complete, yet I have even more reason to feel very auspicious. I am doing what I want. It isn't always easy, but I am living my life and doing what I need to do. Each day I wake up with SO many possibilities. Someone told me earlier today that I had, "such an interesting life." But I wouldn't say that my life is exceptionally unordinary. I just live my life and tell my story as it unfolds. Perhaps one would say that it is my voice and how I tell that story that makes things special. So... right now... I feel flush with positive energy. I know it's sappy and sentimental to say as such, but it's true. Within me there is a quiet voice that says, "Things are good." I have learnt the important lesson of listening to the voices that matter... and right now... this is the one that matters. And it is right... things ARE good. Is it bad that even though I should be sleeping, all I can think about is the new J.K. Rowling book, Harry Potter and the Deathly Hallows? I simply can't wait to read it. My mind is reeling with all the possibilities and how exactly I'm going to procure my copy. Do I wait in line or get it on-line? The disturbing thing is that I've never sat up in bed, thinking about the war in Iraqi like this. Or about equal rights or about earthquakes or even dying whales. Now that I'm feeling better, I'm starting to pile my plate even higher! Is it possible? I was accepted to the next round of the NYC Teaching Fellows, so I'm going to have to prepare for the next interview. If I get the position, it's going to completely change everything! I'm a little nervous, but excited about all the possibilities. I really want to make a difference and give young adults the tools they need to get ahead in life. I'm finishing up my collection of poems. I'm going to take a week or two off from it to gain some perspective before I go back into revisions. All the poems are loosely based on a ficticious woman dealing with the death of her lover. I know, it's not the most up-lifting theme, but once the idea popped into my head... it wouldn't leave. I've started a stack of watercolors that go along with the poems. I might self-publish everything so that I have complete control over the project. I will post more information as it comes. Still looking for the right roommate. It's a trying process, but I think things are getting better. I'm meeting with a really great girl tomorrow for tea to see if we click. Craft night is starting up soon! I'm really looking forward to it. I have a sense that it'll be a good time. My buddies and I sipping on fancy cocktails while making fun artsy projects and catching up! Good times, indeed. The book proposals are going slower than ever. On my days off this week, I'm going to try and go out and capture some inspiration. I think I might go for a long walk and bring my camera. I've started the research for my new paintings. I imagine that's why I've been thinking about myths more than usual nowadays. Many of them will draw heavy reference from them. I'll post some pictures as I complete the new work. Speaking of new work, I've got to start getting my portfolio materials ready for my grad school applications. If the NYC Teaching Fellows doesn't work out, I want to be prepared to apply for graduate school. The Saul Bell Design Competition deadline is coming up soon and I want to finish a piece or two for it! It've got some really great ideas for it. I just wish that I had more time to complete some of the projects that I have in mind that will take lots of time. Oh, and I have to finish up writing some articles. And I can't forget that some of my friends are in town and that I absolutely MUST hang out with them before they leave! So much is going on that perhaps I'm forgetting some things. Like the fact that I've decided to shape my side-burns like the way they have in all those Jane Austen movies. I'll post pictures as soon as they are all grown in and not sparse looking. I love classical literature. One of my favorite myths can be found in Ovid's Metamorphoses. I have been thinking about this one a lot lately. 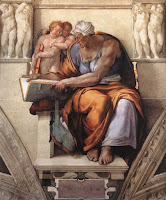 It's the myth of the Cumaean Sibyl. She was one of the most powerful prophetesses of the time and lived in a cave with a hundred openings (which has actually been found). Apparently the Sibyl entered into an agreement with Apollo. She grasped a handful of sand and said that she wished to live a year for each grain of sand in her palm. He granted the wish. However, he did not bestow eternal youth as well. Eventually her body whithered away until she was nothing but her voice, and her voice alone. Some say that if you stand at one of the mouths of the Cumaean Caves, that a voice can be heard in the rushing winds and it is her voice. I had to take a little break from making things for the Art Bead Scene challenge, The Mermaid's Grotto. I just had to deal with some other more pressing matters. However, here is a new one. It's a quickie, but I think a goodie. 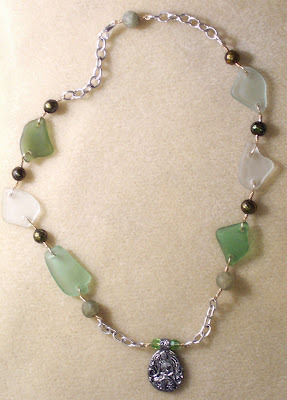 I used pieces of beach glass that my sister, Sheila hand-drilled. 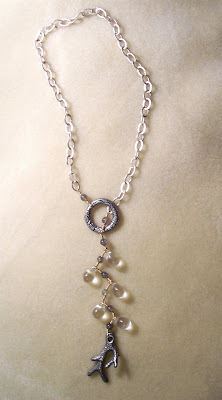 The tumbled serpentine and pearls came from Talisman Associates Inc., the fine pewter mermaid pendant came from my family (Green Girl Studios), and the Swarovski crystals came from Fusion Beads. I got the chain from a store in Raleigh, NC called Ornamentea. I am a Neil Gaiman fan. Cynthia and I once thought that he was coming to Asheville for a reading at Malaprops. However, we didn't read the fine-print on the poster which indicated that it was only a book club meeting. Needless to say, we were disappointed. I am super excited about this fairy-tale adventure adapted into a movie. And who doesn't love Michelle Pfeiffer as a villain? CLICK HERE for the trailer. Philip Pullman is another of my favorite fantasy authors. His Dark Materials Trilogy is truly amazing. When I read the books, I simply couldn't put them down. 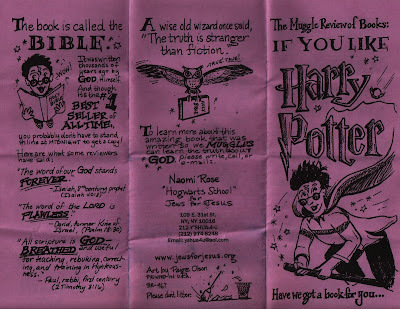 Touted as children's books, they deal with complex ideas about religion and philosophy. The first book, The Golden Compass has been adapted for the big screen and I'm really looking forward to it. CLICK HERE for the trailer. It's starting to look like I only want to read books that have been made from young adult books, but this is another great series of books by Holly Black and Tony DiTerlizzi. They truly are wonderful and fantastical. And the movie has that kid from Finding Neverland. And who doesn't love Mary-Louise Parker? CLICK HERE for the trailer. Another of my favorite authors, though of a different variety, is Jane Austen. When first read, I hadn't a clue what they were all about. But as I became wizened to the ways of social strata and dare-I-say-it, romance, they became intricate social satires that never tire. This movie looks to be interesting. I don't know exactly how factual it'll be, but regardless... I am bewitched, body and soul, by Jane's world. CLICK HERE for the trailer. So, they skipped the first book in the Dark Is Rising Sequence by Susan Cooper, but we'll forgive them that. Yet another fantasy book turned movie, I am really looking forward to it, even if it does seem to have a bit of a cheesy MTV feel to it. CLICK HERE to watch the trailer. Who doesn't love a good inspirational tear-jerker once in a while? I hadn't heard anything about this film until recently. And from the barely-there advertisements, it leaves much to the imagination. But it's about that kid from Finding Neverland looking for this parents using music to find them in the Big City. And who knew that Robin Williams looked so much like Bono from U2? CLICK HERE for the trailer. I hate saying that I "love" Goya's work. It has a horror to it that rips at the very foundations of consciousness, and to sentimentalize something like that seems somehow wrong. I am moved by his work. I am fascinated by it. And seeing a film about his life and inner-demons and muses seems wonderfully interesting. CLICK HERE for the trailer. Walking down the streets of New York City, I saw tons of posters for this movie. But was oblivious to it otherwise. Parker Posey is an iconic New Yorker and an amazing actress. And as much as I hate to say it, I'm hooked on phonics to movies about neurotic females in search of magic in their love-life. I like those and movies with good villains. And movies with magic. CLICK HERE for the trailer. Today was the deadline for the Bright and Beautiful Design Contest 2007 America for Crystalized - Swarovski Elements. Above is my submission for this year's competition. I titled the piece, "Miel." It means, "honey." I got all my Crystalized - Swarovski Elements from Fusion Beads. 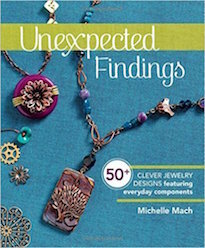 The silver bee box clasp is from my family at Green Girl Studios. When I had originally selected the crystals, the color on my monitor must have been off, because I had thought that the pale (almost green-ish) color of jonquil was much darker and more of canary tone. However, in the long run, I quite like the color palette and pleased that the "honey piece" isn't over-the-top in its color symbolism. Left: I normally don't model the jewelry I make on myself, however, I wanted to see how it looked worn without a mirror. None of my good friends were around... so I had to put it on myself. I quite like the piece. It was inspired by dripping honey. Right: Here is one of the more elaborate and fancy techniques in photographing the piece. It was taken on a mirror to give it that nice sense of floating. It also makes it look like there was more beadwork done with the mirror-image. Above: Still image taken from the new Warner Brother film adaption of J.K. Rowling's, "Harry Potter and the Order of the Phoenix." So, after a few days of frantic work, I decided to take a little break. It was absolutely beautiful outside today! After work, I went up to Bryant Park for some ice cream and then went bead shopping for some new designs for some up-coming competitions. Okay, so the bead shopping was more work oriented, but it was still fun. I then headed back down to Union Square, where I had a quick doze in the shade of the trees. It was so relaxing. I then browsed around Barnes and Noble before meeting up with Jenny to see the new Harry Potter movie. Out of all the books, I think it was perhaps my least favorite of them, but the movie was all right. I liked it more than the last movie, which happened to be my favorite of the books. Some of the scenes in the latest movie were really amazing. I especially like the opening scenes, just before the Dementors show up. I guess the problem I have with these movies is that so much of the content has to be cut out for the sake of being timely, yet certain elements... unimportant things... are enhanced. That and sometimes solid acting is replaced by CGI effect distractions. But, all in all, I liked it. I am definitely looking forward to reading the next installment due out next week! This is just a quick little note. I'm so tired. 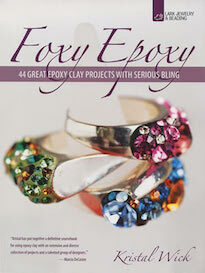 I've been working my fingers to the bone trying to finish up some last minute projects before the deadlines all come. A nice (much-needed) rain came through and cooled things down. I thought it made it perfect for me to show the apartment in, but alas... only a handful of people braved the weather. I will have to host another Open House for the room in my apartment. In other news, I made it to the next rounds of interviews for the NYC Teaching Fellows. Wish me luck. Anyway, I've got to jet now. Lots of work to do still yet. Here is another submission for this month's Art Bead Scene Challenge, The Mermaid's Grotto. I've always had a soft-spot for Classical literature. One of my favorite authors of the ancient world is Homer. He uses a phrase to describe the ocean that I just love. He describes it as, "the wine-dark sea." Doesn't that just conjure up so many images? This piece is an ode to that phrase used throughout his works. The rich reds and burgundies go well with the subtle shades of pink and copper found in the shibuichi pendant that my family (Green Girl Studios) makes. I matched the shibuichi mermaid pendant with an African Dowry ring from Chevron Trading Post in Asheville, NC, Swarovski crystals from Fusion Beads, stones and pearls from Talisman Associates Inc., copper chain from Ornamentea in Raleigh, NC, and borosilicate rondells by Shannon Hill. This isn't one of my necklaces, but actually a surprise belated graduation present from the very talented Candice Wakumoto. She's great! Truly one of my favorite people in the bead world. I love her work. 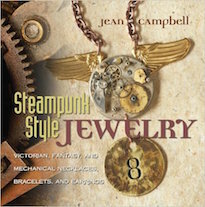 She created the one-of-a-kind silver pendant using the cuttlefish casting technique. 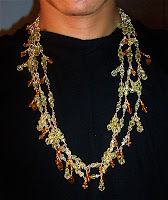 It is strung with "puka" shells, turquoise, chalcedony, horn, and sterling silver on leather chord. Isn't it great? I've made yet another submission for this month's Art Bead Scene Challenge, The Mermaid's Grotto. I was doing a lot of thinking about the sea at different times of day and how depending on weather conditions and where the sun is in the sky, it appears to be different colors. So, I'm breaking a little bit away from the blues and greens that I was working with recently. This one utilizes more purples, grays, and more subtle shades of green. The pewter mermaid doughnut is by my family at Green Girl Studios, the shell beads are from Lillypilly Designs, the "faux-boro" rondells are from Val at Gray Parrot Glass Studio, the stones and pearl are from Talisman Associates Inc., the heavy silver chain is from Jess Imports, and the gold cornerless cubes are from Saki Silver. Since I haven't been to work in a while, things like my over-sized mail have piled-up there. One of the parcels contained a new print by Jamie Fales of Noosed Kitty called, "Stuck on You." I first met her at the Renegade Craft Fair in Brooklyn. It will be added to the growing collection of bunny prints launched by Jen Tong's Bunny Boy. This is my fifth submission to Art Bead Scene's July Challenge, The Mermaid's Grotto. I've still got loads of ideas and acquatic beads left... so I doubt this will be the last. And to answer a question e-mailed to me: Yes, I've created all of these original pieces since the announcement of the challenge. Even though I'm sick, I'm having a lot of fun putting necklaces together for this month's theme. I've held on to this Heather Wynn focal bead for a while now, but really wanted to do something special. I think I have. Heather calls these types of beads, "Tucson" beads. But for me, I think of each of these polymer mokume beads as a little planet, churning with oceans and seas yet to be explored or charted. 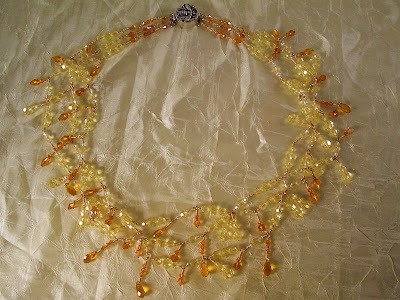 I used the Heather Wynn bead with various stones and pearls from Talisman Associates Inc., gold cornerless cubes from Saki Silver, Swarovski Crystals from Fusion Beads, and vintage lucite from Pudgy Beads. This is yet another submission for this month's Art Bead Scene Challenge. I'm on a roll here with the theme of The Mermaid's Grotto. I've been waiting (actually for a few years now) to use this lampwork "Haiku" bead by Lisa Kan. I wanted to find the perfect way to showcase this little work of art that reminds me so much of the sea. In creating this piece, I also wanted to play around with different textures. 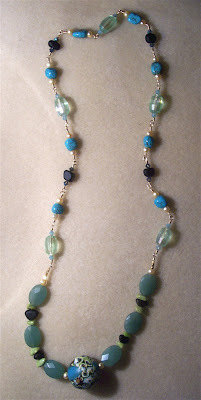 For instance, the smooth matte finish of the natural agate towards the top, to the chunky and crisp faceted "green moonstone" near the bottom right. Both juxtaposed with the lustrous pearls and gilt wire-wrapping. 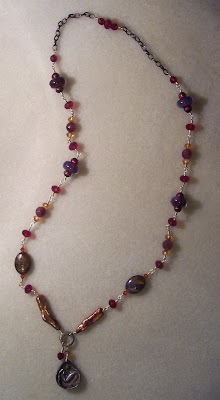 All of the stones and pearls I used came from Talisman Associates Inc. The gold-plated Thai silver square bead with the wave motif came from Singaraja Imports. The gold cornerless cubes came from Saki Silver. I've been spending part of my recovery time reading. I know that I should be resting, but there is only so much that I can sleep and I hate being idle. So, I've been sipping on mint tea and relaxing to poems by Pablo Neruda. Right now I'm reading, Twenty Love Poems and A Song of Despair. It's amazing. His poetry is sensual and melancholy all at once; vivid and poignant. Here is yet another submission for this month's Art Bead Scene Challenge. I wanted to do something a little more modern and abstract for the theme Mermaid's Grotto. 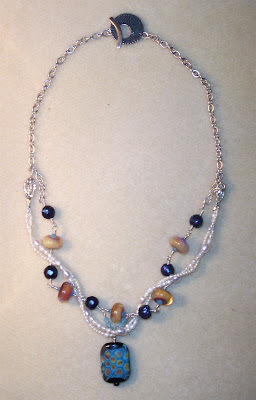 I used borosilicate rondells by Bobby Rhodes of Family Glass, pearls from Talisman Associates Inc., a lampwork focal by Maria of Lost Marbles Lampwork, Swarovski Crystals from Fusion Beads, silver chain from Ornamentea in Raleigh, NC, and a silver clasp by Saki Silver. Overall, I like the design. However, I think I might go back in and tighten the pearl strands around the wire-wrapped one. I also think that I'm going to change how I connected the pearl strands with loops. At first I really liked the loops, now I think they are a bit bulky for this piece. I'm not sure. I'll sit on it for a bit.